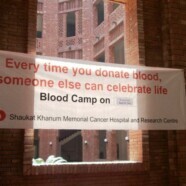 A blood donation camp was set up at Forman Christian College on 26 April 2012 in collaboration with Shaukat Khanum Memorial Cancer Hospital, Lucas Economics Society, Rotaract Club and Griswold History Society. Many students, faculty and staff participated in this event and donated blood for cancer patients. The camp collected 66 bottles of different blood groups in 7 hours. We care, is the student’s message to all the people suffering from cancer.